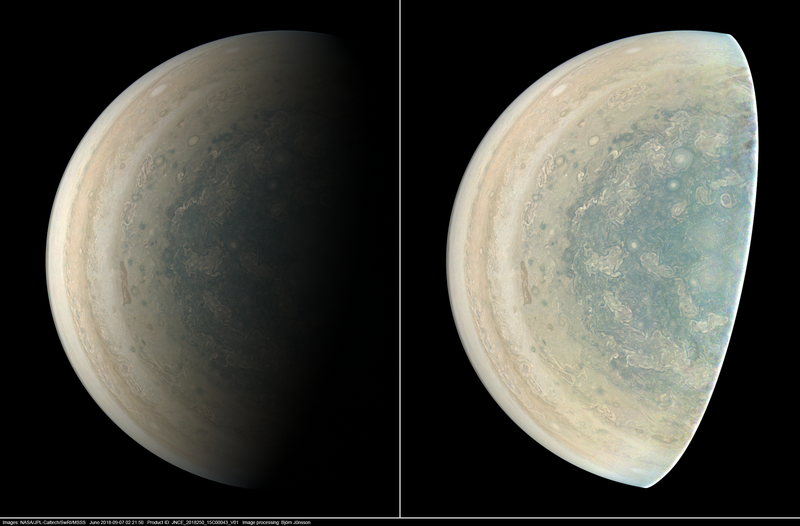 A dolphin-shaped cloud is visible in these Oct. 29 images of Jupiter's southern belt. According to a Nov. 30 NASA photo description, the images that appear in the dolphin series were taken between 2:26 p.m. and 2:46 p.m. PDT (5:26 p.m. and 5:56 p.m. EDT) that day, from about 11,400 miles to 31,700 miles (18,400 to 51,000 kilometers) above Jupiter's atmosphere. While NASA released the photo to the public on Nov. 30, photographer Seán Doran (one of its creators) showcased the image weeks earlier in a Nov. 7 Twitter post. Doran has been processing amazing images of Jupiter based on Juno data since the spacecraft arrived at the gas giant, and along with other space imagery and video based on actual spacecraft data. The dolphin appears to be swimming through cloud bands along Jupiter's South South Temperate Belt. Juno captured this scene at about 32 to 59 degrees south latitude. The Juno mission has been gathering observations of the largest planet in the solar system since arriving in July 2016. It's currently scheduled to remain operational until 2021. Nasa's Juno mission to the gas giant Jupiter has reached its halfway mark and has revealed new views of cyclones at the poles. As it orbits the planet every 53 days - Juno performs a science-gathering dive, speeding from pole to pole. Its sensors take measurements of the composition of the planet, in an effort to decipher how the largest world in our Solar System formed. Mapping the magnetic and gravity fields should also expose Jupiter's structure. 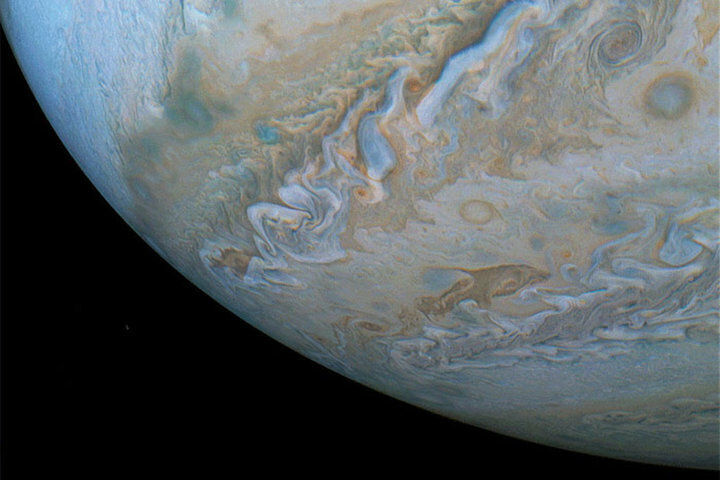 But images from JunoCam - a camera that was intended to capture images that could be shared with the public - has already given us some surprising insights. Dr Candice Hansen, from the Planetary Science Institute in Arizona, is leading the JunoCam project, which she described as "our little outreach camera". She presented some of the remarkable images from the camera - raw images downloaded and processed by members of the public - at the American Geophysical Union meeting here in Washington DC. When we made our first pass over the poles, we knew we were seeing a territory on Jupiter we had never seen before," said Prof Hansen. "What we did not expect was that we would see these orderly polygons of cyclones; huge storms - twice the size of Texas. "We thought, wow - that's spectacular." And 16 passes later, she added, those orderly arrangements of giant storms are still there. These "pretty pictures" are starting to teach scientists about how the largest planet in the Solar System formed and evolved. 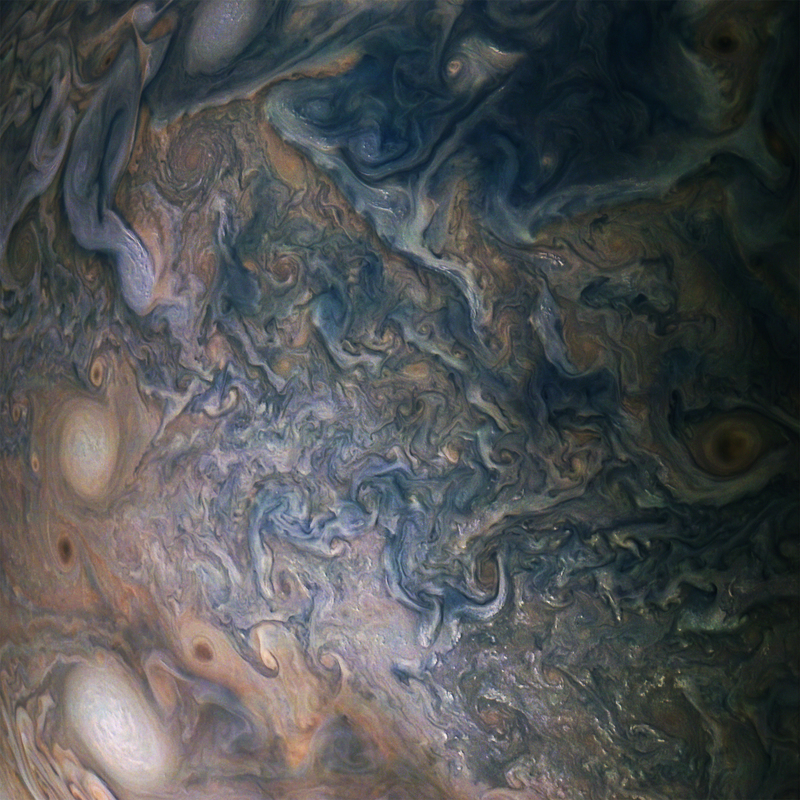 "The objective for the Juno mission is to study the interior structure of Jupiter and how that structure expresses itself out on the cloud tops. That's the kind of connection we're trying to make. But we're not there yet." 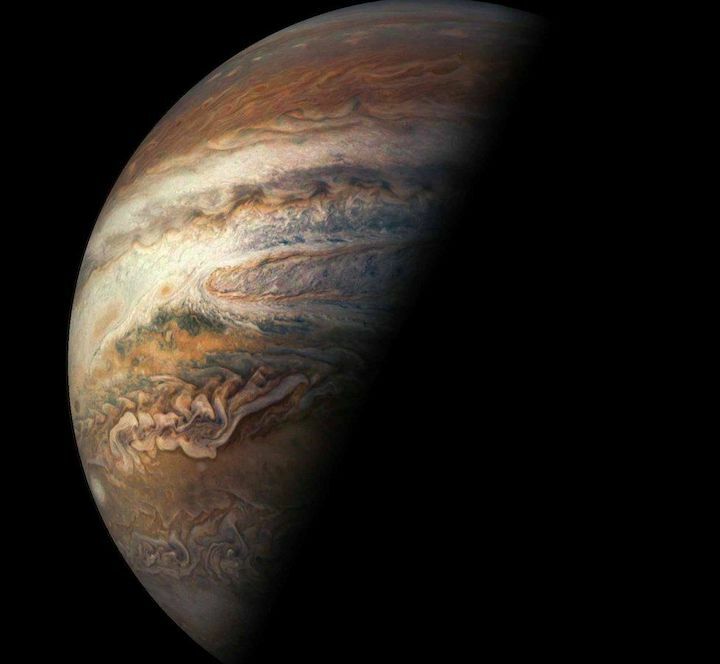 Jack Connerney, Juno deputy principal investigator from the Space Research Corporation in Annapolis, Maryland, said that the second half of the mission would provide an even more detailed view of "what makes the whole of Jupiter tick". 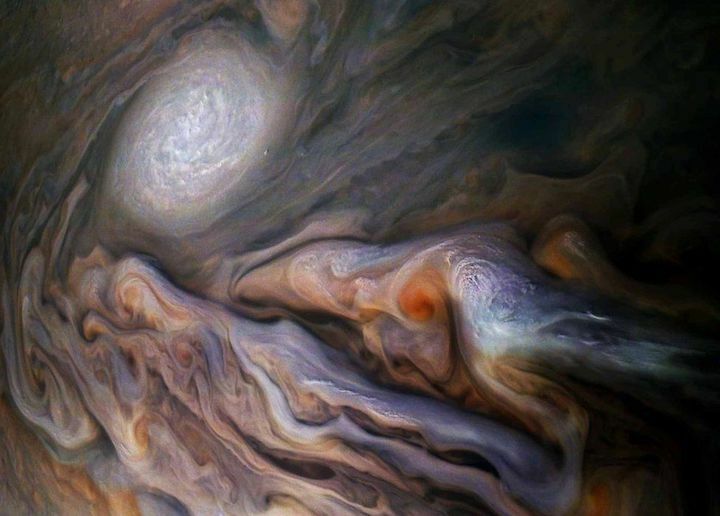 A south tropical disturbance has just passed Jupiter's iconic Great Red Spot and is captured stealing threads of orange haze from the Great Red Spot in this series of color-enhanced images from NASA's Juno spacecraft. From left to right, this sequence of images was taken between 2:57 a.m. and 3:36 a.m. PDT (5:57 a.m. and 6:36 a.m. EDT) on April 1, 2018, as the spacecraft performed its 12th close flyby of Jupiter. Citizen scientists Gerald Eichstädt and Seán Doran created this image using data from the spacecraft's JunoCam imager. This mosaic combines color-enhanced images taken over Jupiter's north pole when the lighting was excellent for detecting high bands of haze. The images were taken in the final hours of Juno's perijove 12 approach on April 1, 2018. 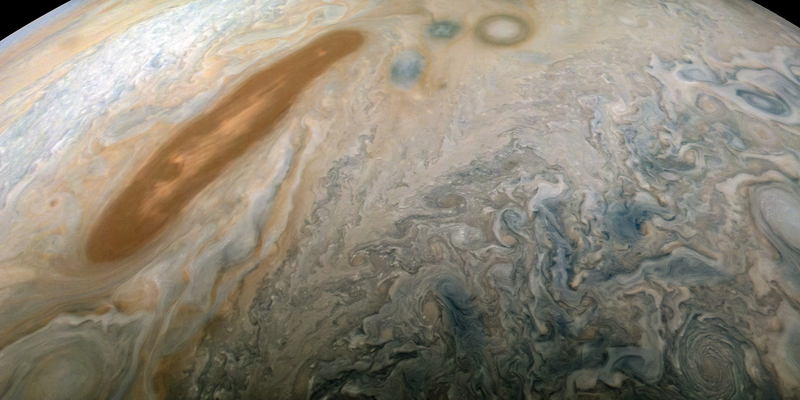 Citizen scientists Gerald Eichstädt and John Rogers created this image using data from the spacecraft's JunoCam imager. 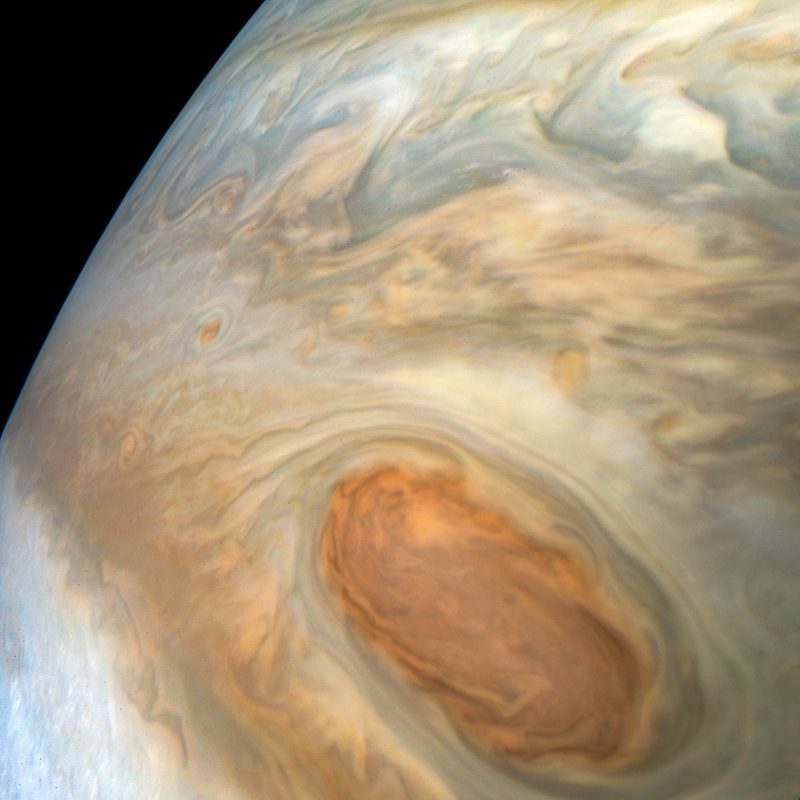 Detailed structure in the clouds of Jupiter's South Equatorial Belt brown barge is visible in this color-enhanced image taken at 10:28 p.m. PDT on July 15, 2018 (1:28 a.m. EDT on July 16), as the spacecraft performed its 14th close flyby of the gas giant planet. Citizen scientist Kevin M. Gill created this image using data from the spacecraft's JunoCam imager. A "brown barge" in Jupiter's South Equatorial Belt is captured in this color-enhanced image from NASA's Juno spacecraft. This color-enhanced image was taken at 10:28 p.m. PDT on July 15, 2018 (1:28 a.m. EDT on July 16), as the spacecraft performed its 14th close flyby of Jupiter. 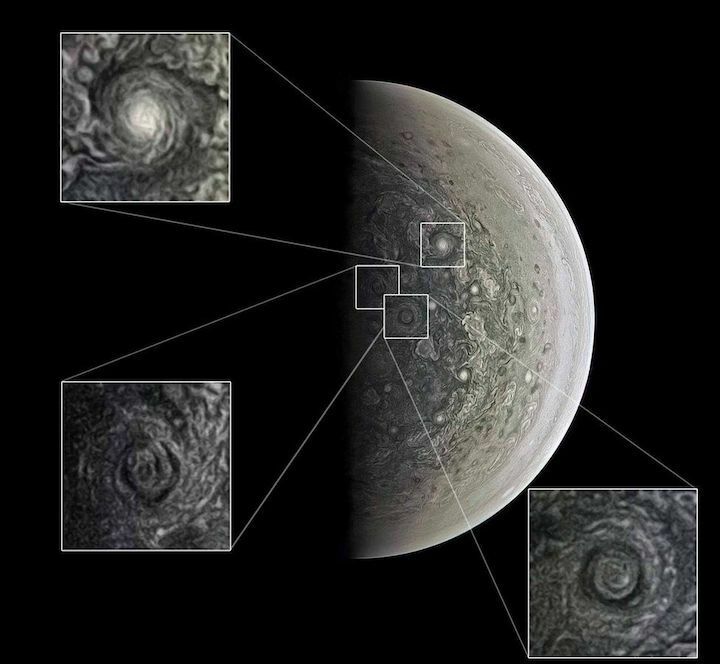 Citizen scientist Joaquin Camarena created this image using data from the spacecraft's JunoCam imager. A long, brown oval known as a "brown barge" in Jupiter's North North Equatorial Belt is captured in this color-enhanced image from NASA's Juno spacecraft. This image was taken at 6:01 p.m. PDT (9:01 p.m. EDT) on Sept. 6, 2018, as the spacecraft performed its 15th close flyby of Jupiter. 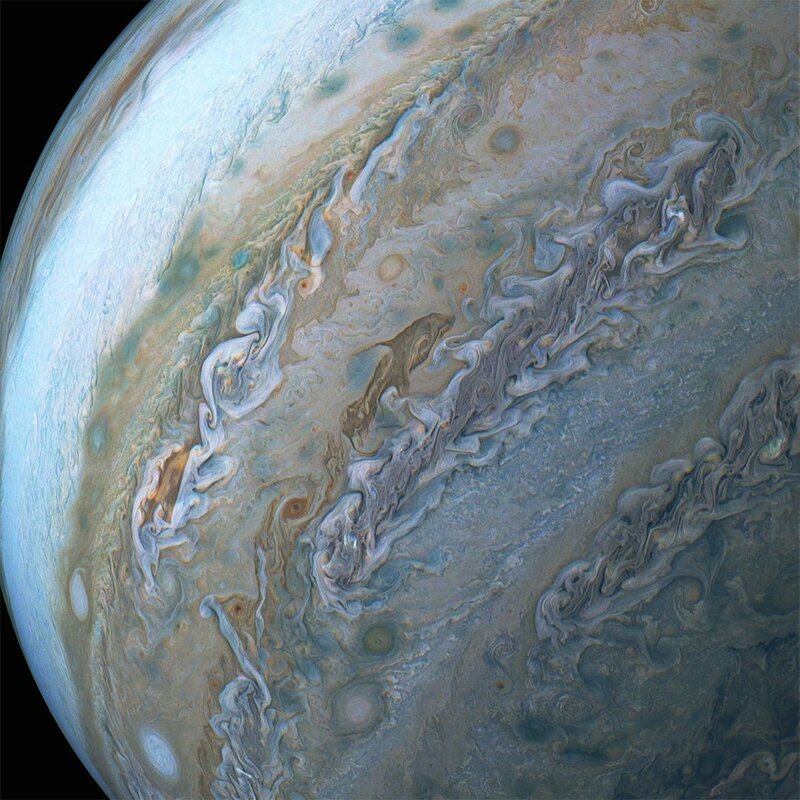 Citizen scientist Kevin M. Gill created this image using data from the spacecraft's JunoCam imager. This Earth-based observation of Jupiter and the South Tropical Disturbance approaching the Great Red Spot was captured on Jan. 26, 2018. 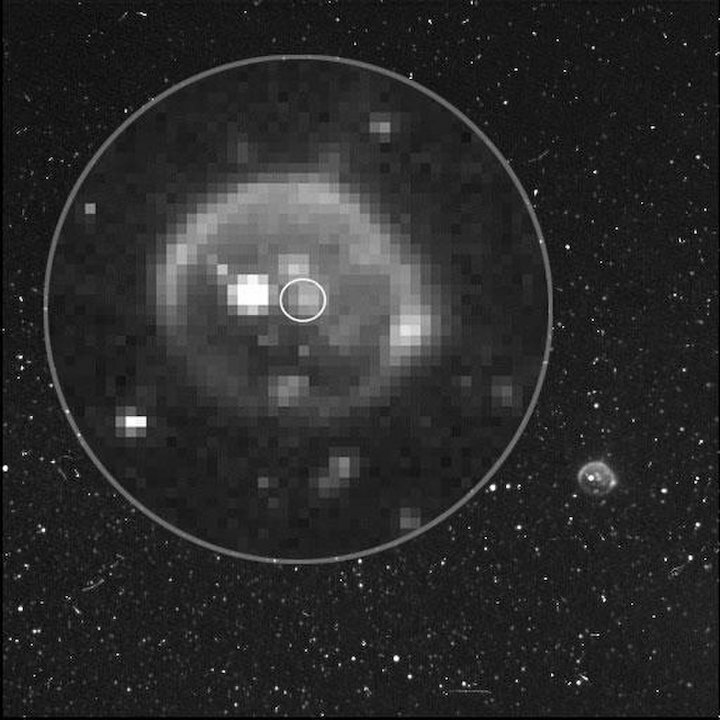 Amateur astronomer Christopher Go took and processed this image. A multitude of bright white "pop-up" storms in this Jupiter cloudscape appear in this image from NASA's Juno spacecraft. 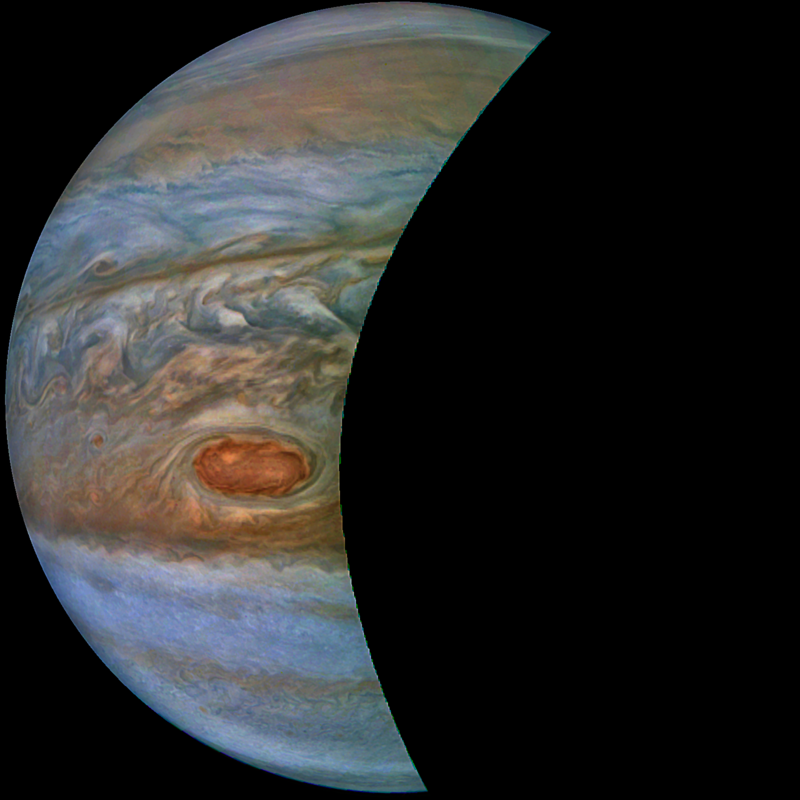 This color-enhanced image was taken at 1:55 p.m. PDT (4:55 p.m. EDT) on Oct. 29, 2018, as the spacecraft performed its 16th close flyby of Jupiter. 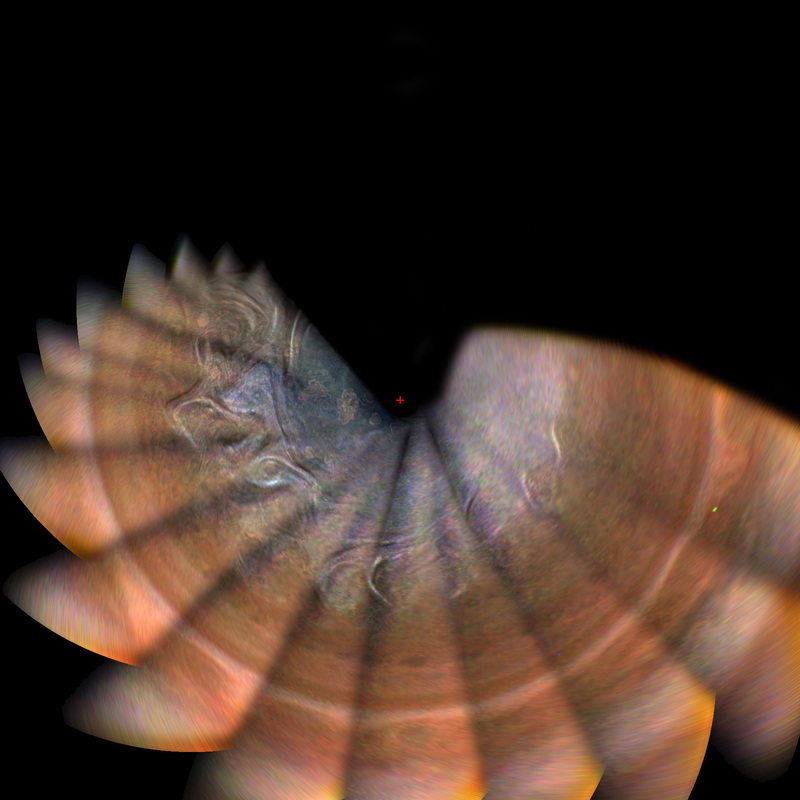 Citizen scientists Gerald Eichstädt and Seán Doran created this image using data from the spacecraft's JunoCam imager. This image was taken at 7:21 p.m. PDT (10:21 p.m. EDT) on Sept. 6, 2018, as the spacecraft performed its 15th close flyby of Jupiter. 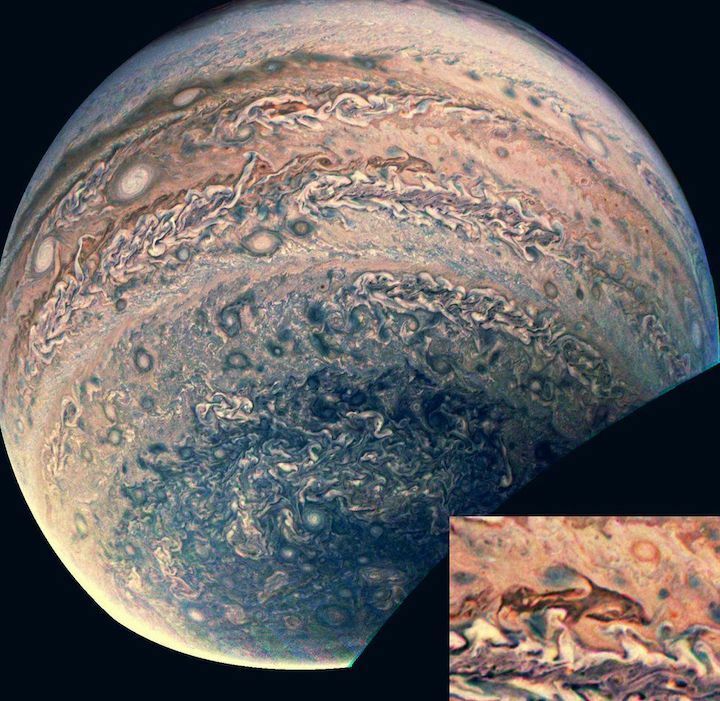 The version of the image on the left side shows Jupiter in approximate true color, while the same image on the right has been processed to bring out detail close to the terminator and reveals four of the five southern circumpolar cyclones plus the cyclone in the center. 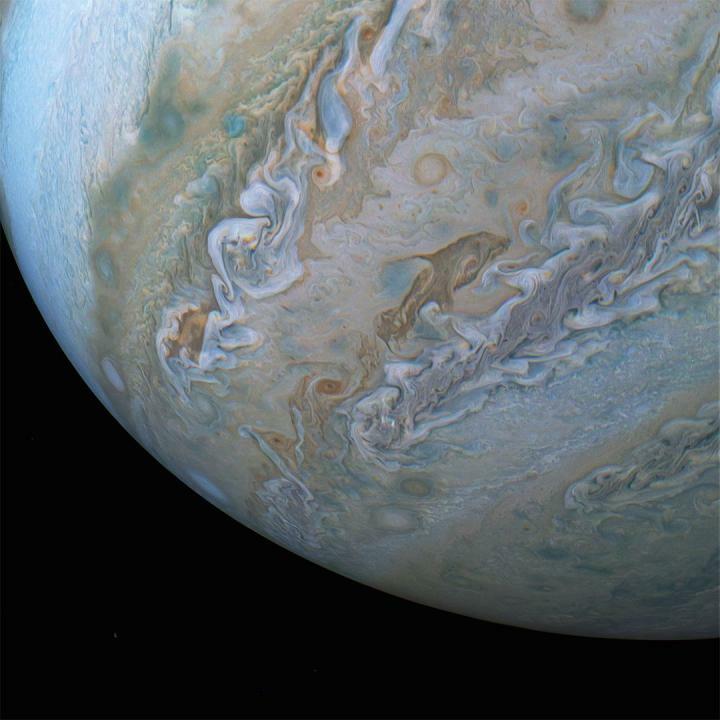 Citizen scientist Björn Jónsson created this image using data from the spacecraft's JunoCam imager. Jupiter's northern circumpolar cyclones are captured in this color-enhanced image from NASA's Juno spacecraft. The image was taken at 5:42 p.m. PDT (8:42 p.m. EDT) on Sept. 6, 2018, as the spacecraft performed its 15th close flyby of Jupiter. 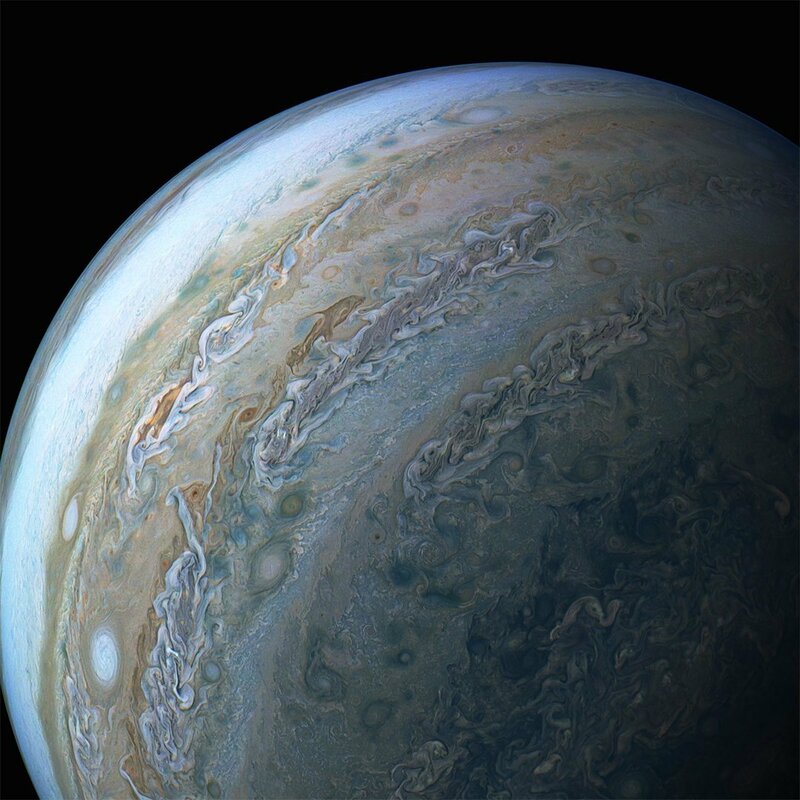 Citizen scientist Gerald Eichstädt created this image using data from the spacecraft's JunoCam imager. "With our 16th science flyby, we will have complete global coverage of Jupiter, albeit at coarse resolution, with polar passes separated by 22.5 degrees of longitude," said Jack Connerney, Juno deputy principal investigator from the Space Research Corporation in Annapolis, Maryland. "Over the second half of our prime mission — science flybys 17 through 32 — we will split the difference, flying exactly halfway between each previous orbit. This will provide coverage of the planet every 11.25 degrees of longitude, providing a more detailed picture of what makes the whole of Jupiter tick." Launched on Aug. 5, 2011, from Cape Canaveral, Florida, the spacecraft entered orbit around Jupiter on July 4, 2016. Its science collection began in earnest on the Aug. 27, 2016, flyby. During these flybys, Juno's suite of sensitive science instruments probes beneath the planet's obscuring cloud cover and studies Jupiter's auroras to learn more about the planet's origins, interior structure, atmosphere and magnetosphere. 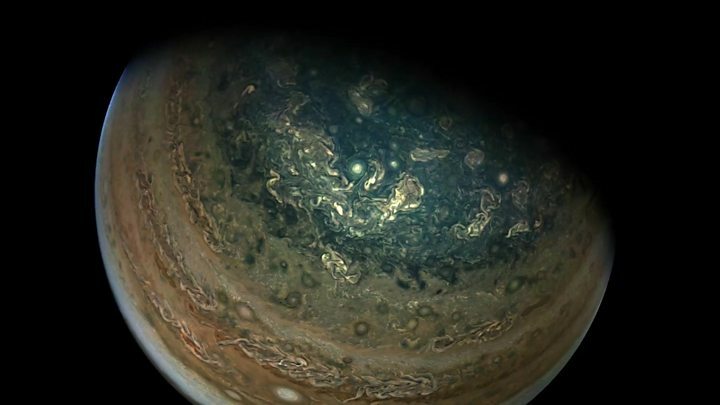 "We have already rewritten the textbooks on how Jupiter's atmosphere works, and on the complexity and asymmetry of its magnetic field," said Scott Bolton, principal investigator of Juno, from the Southwest Research Institute in San Antonio. "The second half should provide the detail that we can use to refine our understanding of the depth of Jupiter's zonal winds, the generation of its magnetic field, and the structure and evolution of its interior." "We always knew the SRU had a vital engineering job to do for Juno," said Heidi Becker, Juno's radiation monitoring investigation lead at NASA's Jet Propulsion Laboratory in Pasadena, California. "But after making scientific discoveries in Jupiter's radiation belts and taking a first-of-its-kind image of Jupiter's ring, we realized the added value of the data. There is serious scientific interest in what the SRU can tell us about Jupiter." "While originally envisioned solely as an outreach instrument to help tell the Juno story, JunoCam has become much more than that," said Candy Hansen, Juno co-investigator at the Planetary Science Institute in Tucson, Arizona. "Our time-lapse sequences of images over the poles allow us to study the dynamics of Jupiter's unique circumpolar cyclones and to image high-altitude hazes. 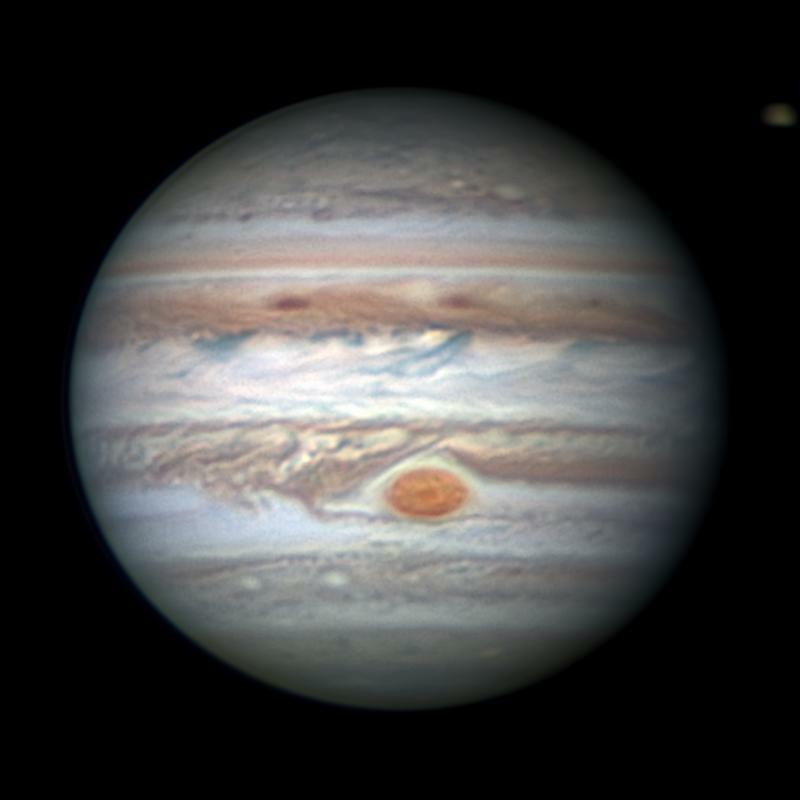 We are also using JunoCam to study the structure of the Great Red Spot and its interaction with its surroundings." 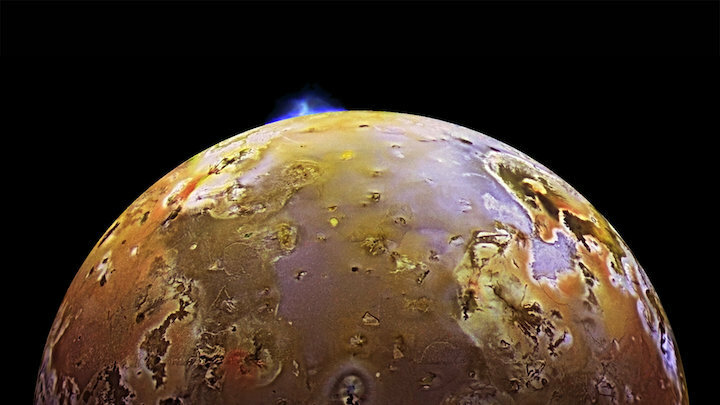 "We knew we were breaking new ground with a multispectral campaign to view Io's polar region, but no one expected we would get so lucky as to see an active volcanic plume shooting material off the moon's surface," Scott Bolton, principal investigator of the Juno mission, said in a statement released by the Southwest Research Institute, which contributed two instruments to the mission. "This is quite a New Year's present, showing us that Juno has the ability to clearly see plumes." NASA's $1.1 Juno spaceraft launched to Jupiter in August 2011 and arrived in orbit around the gas giant on July 4, 2016. The mission is expected to run through 2020.